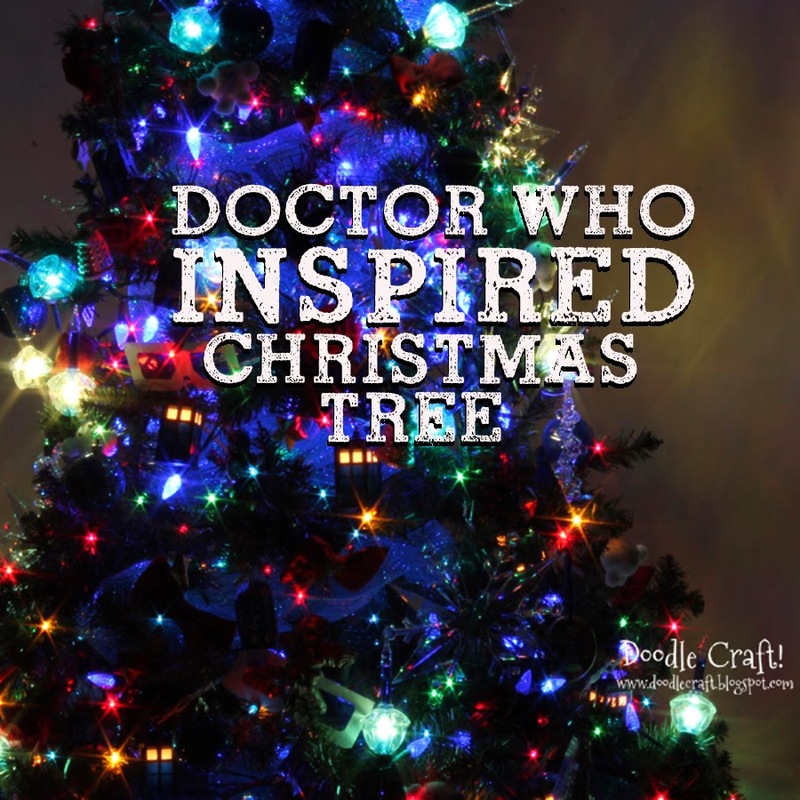 Doodlecraft: Doctor Who Inspired Christmas Tree! Doctor Who Inspired Christmas Tree! This Christmas Tree is cool! If you follow me on Instagram, you'll know I was dying to show you this! Doctor Who inspired Christmas tree...on a small budget! I wanted it to be "Doctor Who Chic"
and bought all they had for $1. 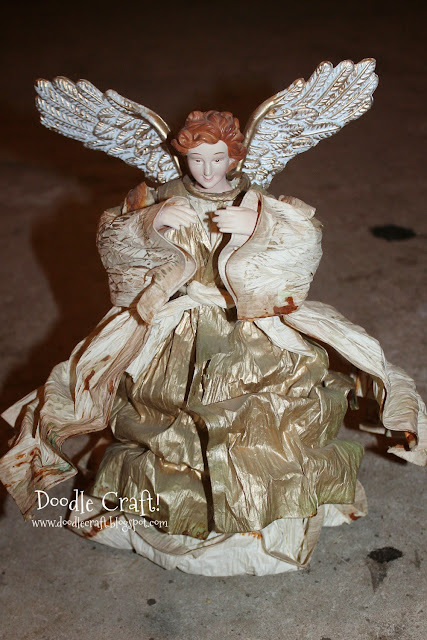 that I had found this Angel Tree topper at Goodwill and started painting it. I wrapped the blue mesh around the the inside of the tree to cover the skinny fake trunk. 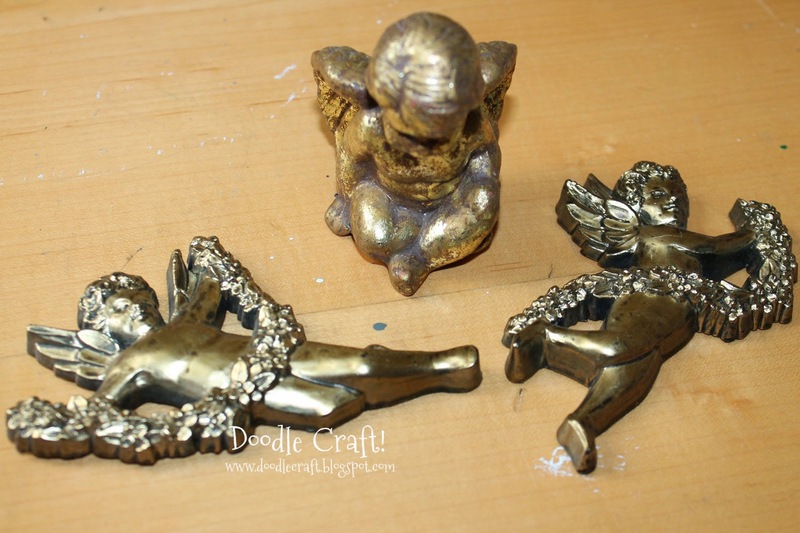 Added the angel on top...and already it's looking great! I had a string of Tardis lights from Thinkgeek and some vintage Bubble lights. We call it Memory Snow! --They're silly! After adding on all the lights, the tree is prepped for ornaments! Like the plaster Tardis and Daleks. It was easy to hot glue a ribbon or hook on the back of them and hang them up. 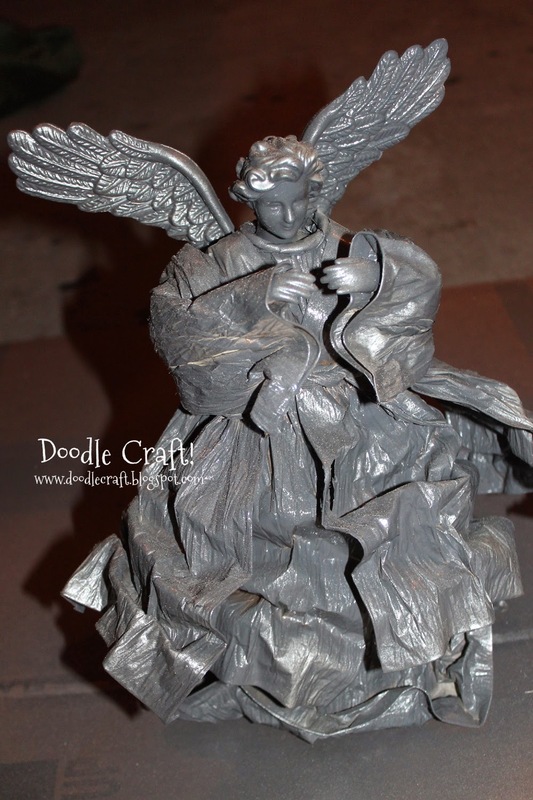 And any random angel found thrifting and painted gray and silver. These pom-pom adipose babies just needed hooks hot glued on them too! Plaster stars and 3D glasses are the perfect touch! And cheap letter stamps to make fun phrases. Dried and then painted Tardis blue! Topped off with some bowties, stars and any blue ornaments...and of course some roses! time exposure just like our light painting! I love this! The angel you found for the top is perfect! I may have to add a few of these ideas to our tree this year and see if anyone notices - they already think I am Doctor Who crazy! :) The roses were also a touch of genius! ;) Thanks for sharing. Checking out your posts is a great way to count down the days until the Day of the Doctor.